Gregory Craig, 74, was charged lying and hiding information connected to his work for Ukraine. 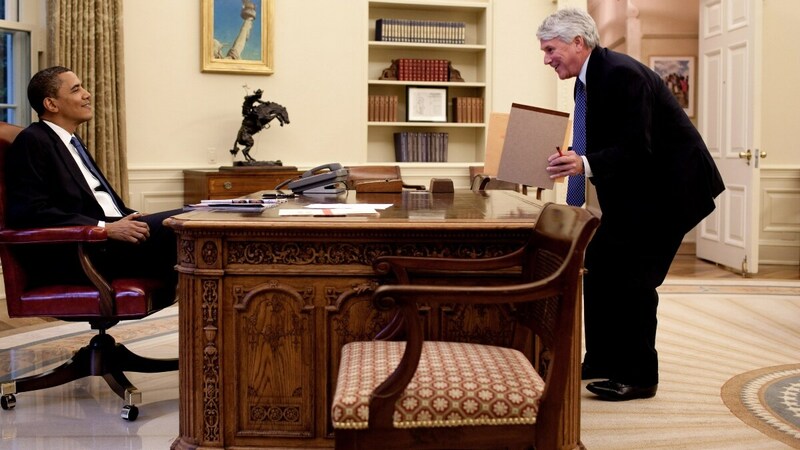 President Barack Obama speaks with White House Counsel Gregory Craig in the Oval Office on June 11 2009. (White House Photo by Pete Souza)This official White House photograph is being made available for publication by news organizations and/or for personal use printing by the subject(s) of the photograph. The photograph may not be manipulated in any way or used in materials, advertisements, products, or promotions that in any way suggest approval or endorsement of the President, the First Family, or the White House. Federal authorities on Thursday charged Gregory Craig, who served as White House counsel to President Barack Obama, with lying and hiding information connected to his work for Ukraine, according to USA Today. The 74-year-old lawyer was charged by the Justice Department’s Foreign Agents Registration Act, or FARA, unit. He faces five years for the charges that are related to Robert Mueller‘s federal investigation of Russia’s involvement in the U.S. presidential election in 2016. Craig, who has been allegedly interviewed many times regarding the investigation, reportedly lied about the type of service his law firm, Skadden Arps, was doing for the Ukrainian government during a special counsel’s office interview in October 2017. His firm was hired by former Ukrainian President, Viktor Yanukovich’s government for conducting a formal report that defended Yanukovich, who is a “Kremlin ally,” to “prosecute and imprison” former prime minister, Yulia Tymoshenko. Craig, contacted his partner at the firm in February in 2012 saying, “I don’t want to register as a foreign agent under FARA. I think we don’t have to with this assignment, yes?” indictment papers state. Craig’s attorneys said he was already investigated by the Southern District of New York and his case was “put to rest,” as a response to the DOJ’s announcement. “This case was thoroughly investigated by the SDNY (Southern District of New York) and that office decided not to pursue charges against Mr. Craig,” the attorneys said.